The Philadelphia Continuum of Care (CoC) is an inter-agency planning body works to coordinate and implement a system that prevents and eradicates homelessness in the city through a collaborative, community-based process. Membership in the CoC is open to all stakeholders in Philadelphia interested in its work. It is a broad-based coalition of housing and service providers, persons with lived experience of homelessness, advocates, government representatives, and other community members working together to shape citywide planning and decision-making. What is a Continuum of Care (CoC)? quickly rehouse individuals and families experiencing homelessness, increase their access and utilization of mainstream social supports, and optimize their self-sufficiency. The CoC Program consolidated previous funding programs and formalized requirements for the governance of decision-making bodies called Continuums of Care. Building on previous committees and collaborative planning efforts, the Philadelphia Continuum of Care was established in 2014. The Philadelphia CoC works to establish local priorities for system planning and to evaluate system-wide performance toward making homelessness rare, brief, and non-recurring. The CoC must prepare and submit a collaborative application to HUD for CoC Program funding to support the operation of homeless assistance projects comprising more than 2,500 units of Permanent Supportive Housing (PSH) for persons with disabilities, Rapid Re-Housing and Transitional Housing, Homeless Management Information System (HMIS) operation, and CoC Planning activities. This requires designing a local funding competition and a local project ranking strategy. The CoC also must engage in Consolidated Planning as it relates to homelessness and particularly Emergency Solution Grant (ESG) spending. To read OHS’s report to the Homeless Continuum of Care Board click on the image above. 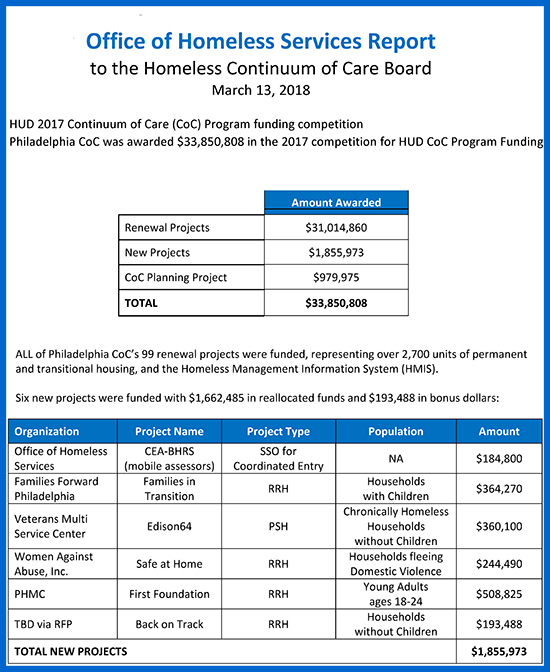 A full breakdown of Philadelphia’s HUD CoC Program Funding Award can be found at the following link. As part of monitoring progress towards performance goals, each January, the CoC conducts an annual comprehensive Point-in-Time Count of persons experiencing homelessness and a Housing Inventory Chart of all the homeless assistance beds operating in the Philadelphia CoC to identify gaps in the system. The CoC is also engaged in establishing a well-advertised and transparent Coordinated Entry and Assessment-Based Referral System (CEA-BHRS) that provides people at risk of or experiencing homelessness access to a streamlined and standardized process that links them to appropriate resources to resolve their homelessness. The Philadelphia CoC Governance Charter outlines the roles and responsibilities of its Board and committees. The CoC Board approves all CoC policies procedures, and funding decisions, with input from the CoC Advisory Committee, subcommittees/workgroups, and the City of Philadelphia Office of Homeless Services. The Board has representation from City government, the service provider community, people who have experienced homelessness and other relevant community stakeholders. Policy and process recommendations related to emerging trends, service gaps, etc. The CoC has designated the City of Philadelphia Office of Homeless Services as the Collaborative Applicant for CoC program funds and the CoC HMIS Lead. Homeless Services also staffs the CoC and leads the effort to establish and operate CEA-BHRS. For more information about the Philadelphia Continuum of Care or how to get involved, contact Gina Ruggieri, Director of CoC Planning, at 215-686-7186 or Leah Staub, CoC Board Program Manager, at 215-686-7163.